The Mercedes 115 chassis automobile was manufactured from 1968 to 1976. 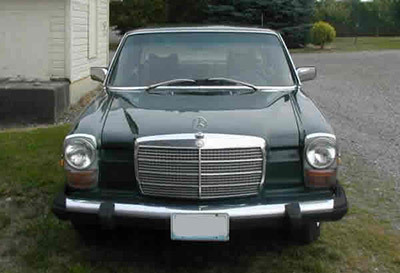 In U.S. version they all had a single large round headlight with a large yellow turn signal/marker lens right below the sealed beam headlight bulb These entry level Mercedes were produced only in four door sedan and two door versions. The coupes only came with a 6 cylinder gas engine. The sedans were fitted with four and five cylinder diesel powerplants. Mercedes 115 chassis owners praise the ride and handling and classic Mercedes styling. The diesel versions in particular are still seen on the road today as daily drivers. If you have a European Spec. Model most parts will interchange but there may be differences in headlights, bumpers, and engine parts. Nothing like a good smooth working power or manually operated non tilting sunroof (up to 1985)! Shake, side pull, binding, grabbing, grinding, squealing, overheating and soft / hard pedal issues. One of the most common problems we see on older Mercedes. Unknown battery drain, electrical shorts, blown fuses - these can be difficult to isolate! Steps to diagnose and repair it before it becomes a MAJOR problem. Steps to fix it after it does! If your car has the old style sealed beam headlights there is a great solution! Sometimes the fix can be real simple and real cheap. You can do it yourself without the hassle and bad side affects of welding! Yes there is! Miracle Paint and fiberglass cloth can work miracles. Not always the best solution as you will see here. What is Causing Diesel OM616 and OM617 Vacuum Pump Failures?